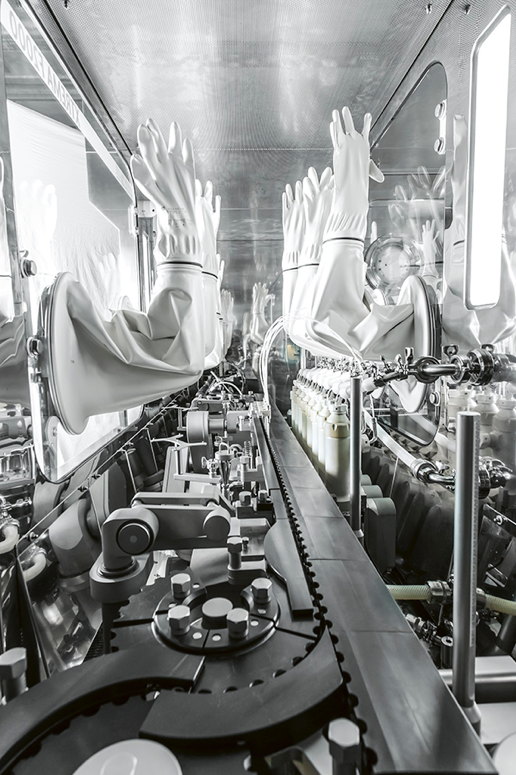 The increasingly widespread use of isolators in the aseptic process meets the need to maintain product sterility levels by reducing the risk of microbiological contamination. In Part 1 we described the typical phases of the decontamination cycle with vaporised hydrogen peroxide. 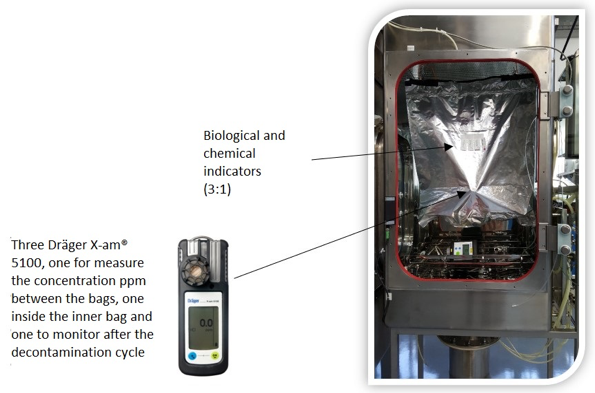 In present Part 2 we discuss the importance of running studies to ascertain the compatibility of the vapour phase hydrogen peroxide on the materials in isolated filling line machines, process materials and component materials necessary for production, as well as the validation phases of a cycle with vapour phase hydrogen peroxide. Type of material – the materials may present different behaviours: absorption, spontaneous release (outgassing), catalysis. – Materials that are part of the machines inside the isolator (liquid or powder filling machines, capping and loading/unloading systems). The compatibility of all materials that are part of the machines inside the isolator is guaranteed by the supplier via an assessment. The assessment for material compatibility with VPHP must consider the chemical compatibility with liquid hydrogen peroxide, an assessment of the absorption and release of VPHP and an assessment of the impact of the materials on the effectiveness of the cycle. – Process materials (e.g. : bags with active ingredient, NEST). If the production process requires the containment of an active ingredient or excipients in bags or if vials pre-sterilised inside NEST are used and specific studies do not already exist, it is advisable to run tests on these materials in conditions closest to those of production decontamination cycles, considering a worst case approach to exposure times (e.g. a cycle repeated due to failure). In particular, check the absorption and release of material, run a cycle with biological and chemical indicators to check for any catalysis of materials. Figures 3 and 4 show two examples of tests run at the same time as the design of the isolated line. Figure 3 – Example of process materials: bags with active ingredient. Test with double bag with active ingredient in powders line to be decontaminated inside a material transfer isolator (MTI). The test aim was to ascertain that VPHP does not permeate into the bag with the active ingredient. 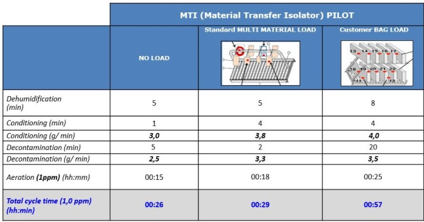 Figure 4 – Example of cycles with different process materials in an MTI. Comparing the NEST load with data obtained from tests with no load or with a standard load (bags with Petri dishes of different sizes), pincers and film, the decontamination and aeration times are considerably increased due to the material. Bags with Petri dishes, tools such as spanners and screwdrivers, marker pens, bags with cleaning or sanitising cloths, bags with adhesive tape, filling systems, size parts. The machine supplier and the customer will work together to draw up a list of the necessary tools. Figure 5 shows a practical example. Once the validation of the isolated line and the VPHP generator are complete, the definition of parameters and the subsequent validation of the VPHP cycle can begin. The aim of the definition of parameters is to arrive at a VPHP cycle with defined temperature and humidity settings for starting the injection, the quantity of H2O2 to be injected and the duration of the conditioning phase and the quantity of H2O2 to be injected during the decontamination phase. All these parameters will be tested in the subsequent phase, i.e. in the cycle validation. Before beginning to validate the decontamination cycle, it is important to simulate production line operation with actual engineering runs, simulating all routine (sampling, microbiological activities, operator interventions) and non-routine activities (tools and parts to be dismounted for size changeovers, special maintenance, damage to machine parts, removal of vials/stoppers/caps, etc. ), taking into consideration all the materials that must be present or introduced during production and/or during the media-fill validation of the production campaign (often the load worst case). This activity is used to check the load is correct, normally envisaged in the mock-up phase, and becomes effective if carried out after training and acceptance of the machine through close collaboration between the customer, the machine and isolator supplier and those developing the decontamination cycle. – Performance Qualification, in which the cycle chosen in the first phase is run three times using biological and chemical indicators at the same worst case points; the aeration phase is validated at the same time as the three tests. 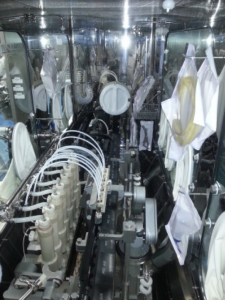 The first activity carried out and documented during the Cycle Development is the definition of the load, which is made up of machine parts and tools suggested by the machine manufacturer, Petri dishes used for microbiological sampling, cleaning/sanitising cloths and adhesive tape, decided with the customer based on production requirements. The surfaces and materials of the isolator are then thermally mapped to define the thermal profile and identify points with high variability, i.e. those in which cycle effectiveness may not be optimal. To gain a complete picture of VPHP distribution, it is also important to pair a chemical indicator with each probe. Normally, an assessment is carried out, taking into account the isolator’s dimensions, design and critical process points, the load materials and the results of the thermal and chemical mapping, in order to define the most critical points that require monitoring through the use of biological and chemical indicators. Based on our experience, particularly when injecting downstream of HEPA/ULPA filters, we have found it very effective to also run a simulation test of VPHP distribution inside the isolator via a smoke test, using vapour, which leaves no residue, injected at a similar flow rate to that in which VPHP is injected. The smoke test is recorded in several areas of the isolator and the video subsequently analysed to determine the areas reached most slowly by the smoke. The chemical and biological indicators must be distributed as uniformly as possible throughout the internal surface of the isolator. As for the number of biological indicators per position, take into account the presence of possible rogues in commercially supplied batches, i.e. biological indicators affected by production issues and as such present growth even after very long decontamination times. Since the presence and exact number of rogues is unforeseeable (it may change from batch to batch), we felt a more robust option was the statistical approach using the Halvorson-Ziegler equation to calculate the MPN (most probable number) and the SLR (spore log reduction) to guarantee a reduction of at least 6 log at all points and in all cycles. Following this approach, three biological indicators are positioned at each critical point, while chemical indicators are placed adjacent to the biological ones in a ratio of 1:3 (one chemical indicator and three biological indicators). A maximum acceptable number of rogues is set for each cycle and for the various repetitions, to be sure that they are actually rogues. This approach is used in both of the phases indicated below and can be seen as more robust than an approach with a single biological indicator with analysis of deviation due to rogues, because it avoids having to add further variables to the verification process (e.g. repeating a cycle to check the fault introduces the possibility of a fault in the cycle that is not subsequently repeated) and scientifically manages the phenomenon from the acceptance criteria. Once all the positions are established, several cycles are carried out to verify VPHP uniformity and distribution, during which the only parameter that changes is the duration of the decontamination phase. 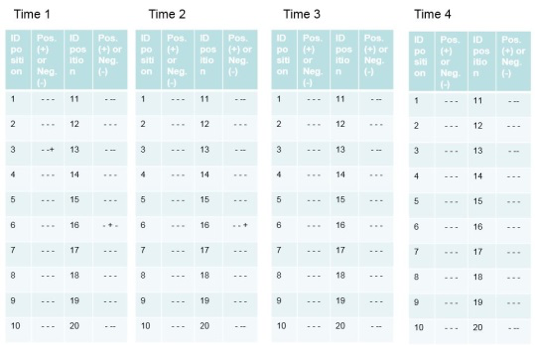 Using this approach, a longer cycle enables verification of the time needed for a reduction of at least 6 log at all points and identify any issues with biological indicators (rogues) or the process, while a reduction of at least 6 log is harder to achieve in a shorter cycle. Figure 6 shows an example of the results following the Cycle Development. Figure 6 – Example of results of a Cycle Development. In this example, there are four decontamination times increasing from Time 1 to Time 4. The results of the biological indicators (positive and negative) are expressed based on the position of the biological and chemical indicators. A cycle that is conforming at the end of the Cycle Development is chosen for the second validation phase, called Performance Qualification. The purpose of the latter is to confirm, through repetition of three tests, that the parameters of the decontamination cycle in the Cycle Development are reproducible and consistent. The 6 log reduction through the use of biological indicators and the significant change in colour of the chemical indicators in the same positions as the Cycle Development must be demonstrated. Each of the three Performance Qualification tests also demonstrates the uniform reduction of the concentration of hydrogen peroxide (from 1 ppm as a limit for operator safety to 50-100 ppb for products sensitive to oxidation due to residual VPHP or VPHP released from materials) in the entire isolator at the end of the aeration phase, through a mapping carried out with portable hydrogen peroxide concentration detectors. For products sensitive to VPHP, it is also important to monitor that there is no regrowth of VPHP concentration during production phases, and this is preferably guaranteed by systems with catalysers in the air circuits that operate in the aeration and production phases. In these cases, while validating the aeration phases, it is important to monitor production for a period and check that the system envisages automatic checks active even during routine production. If the three cycles meet the requirements, the parameters are validated and the decontamination time is increased by a safety factor, which will be the final time used by the customer in production.